We have already discussed about phasors and its simple properties. Perhaps now it is the time that we want to explore a little more. Every effort is made to keep it as simple as our previous article. Before proceeding further I want to clarify that here we are mainly concerned about phasor multiplication and 'j' and 'a' operators.This article will also help us better appreciate the use of symmetrical components ( for analysis of unbalanced 3-phase systems) and subsequently other phenomena in transformer and AC circuits. 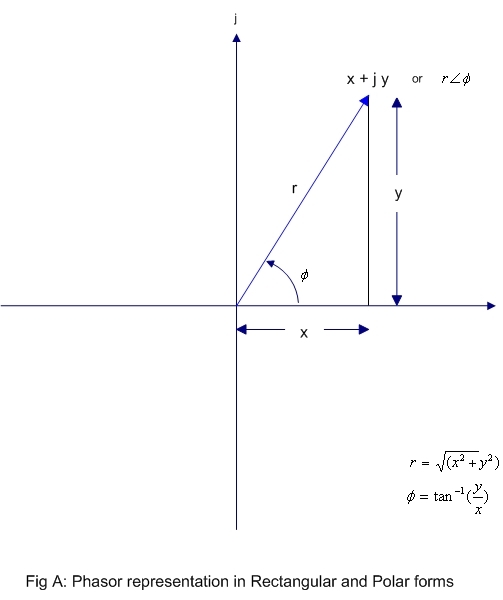 We know that phasor in the form x+j y is drawn as an arrow from origin to (x, y) point. 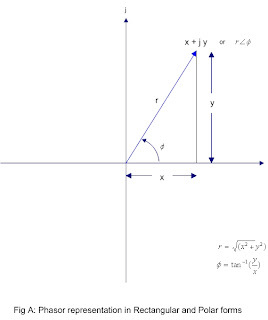 Till now I represented the phasor in x+j y form also called rectangular form. A phasor can also be represented in polar form. In the polar form we also need two parameters, these are length of phasor (r) and angle(phi) it makes with the +ve horizontal axis . See the Figure-A. I have already discussed the use of j in phasor representation. We know that j is equal to square root of -1. Directly multiply each of real and imaginary parts from A with each of B. It is simple! Representing in polar form, the multiplication has become extremely easy. Just multiply the lengths and add the angles to get the new phasor. You can convert it back to the rectangular form. What we will get, if a phasor is multiplied with j? Now draw the phasor -4 + j 3. 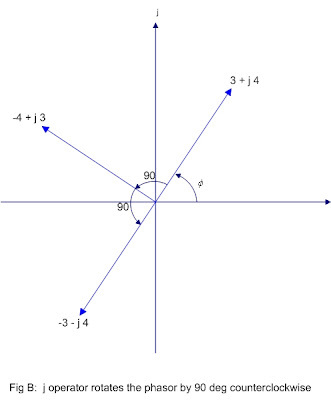 It will be observed that the angle between 3 + j 4 and -4 + j 3 is 90 degrees. Any phasor when multiplied by j will rotate the original phasor by 90 degrees in anticlockwise direction. Now if the resultant phasor is again multiplied by j then the phasor is again rotated by 90 degrees in anticlockwise direction, so on. 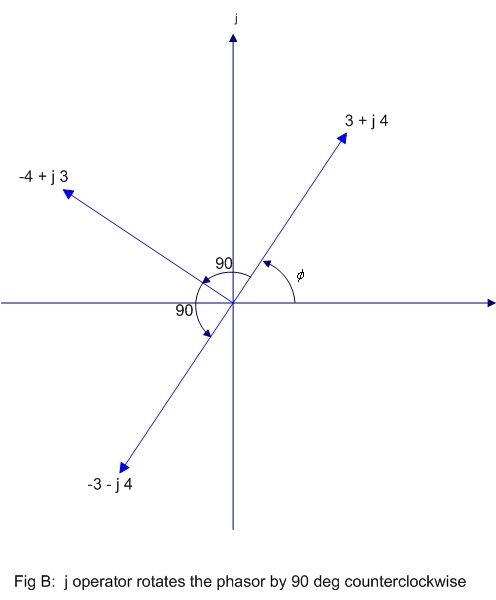 In our example j(-4 + j 3) = -j4 -3 = -(3 + j 4), which is in opposite direction to (p + j q). So clearly the phasor has again undergone 90 degrees anticlockwise rotation. See the figure. 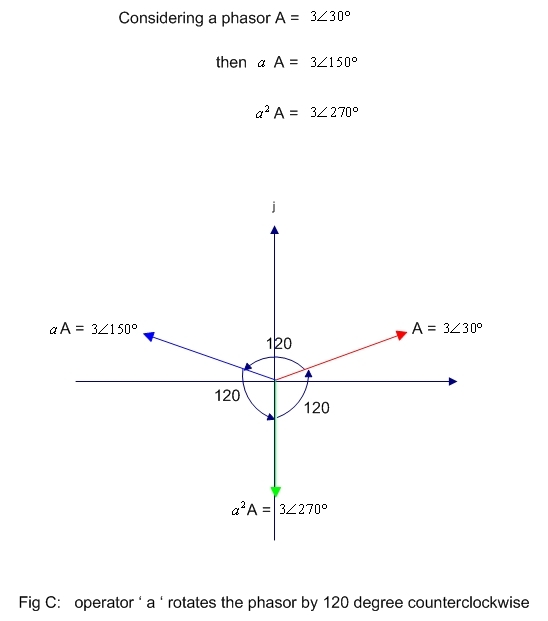 Every time we apply j, we rotate the phasor counterclockwise by 90 degrees. Now let us consider about another operator ' a ' (standard symbol). It has the capacity to rotate a phasor counterclockwise by 120 degrees. applying ' a ' twice the phasor is rotated by 240 degrees, by applying thrice the original phasor is rotated 360 degrees or one complete rotation, so the original phasor. see the Fig-C how a phasor A is rotated by 120 degrees when applied with operator a.
I colored them red green and blue to recall our balanced three phase system. Clearly we are able to get the phasors B and C by applying the operator a repeatedly on phasor A. Otherwise we can say that, the balanced system of A-B-C sequence can be equally represented in terms of 'a' and A only. The operator a will be used more in our article symmetrical components. thanks alot....this tutorial was very helpful....but can u please show how do we add j operator in polar form ?